A brief explaination what Privateers were and what Privateer gamemode is. Discussion in 'Privateer Discussion' started by Xillenn, Jan 8, 2017.
Who were Privateers and from where did they originate? We've all heard of a term "Pirate", but not of a term "Privateer". Privateers are something you'd call "legal pirates". They got their ships from the government, were hired by the government to hunt down the pirates or to do dirty work for the government. Basically, legal naval mercenaries that the government controlled, while Pirates were lawless scavengers of the sea who pillaged and sacked for anything they could get. It's important to mention that privateers had immunity from the country they were "hired", but if you were e.g a British privateer and a Spanish ship would catch you, you were screwed, unless you also had a friend Spain or some kind of an immunity. 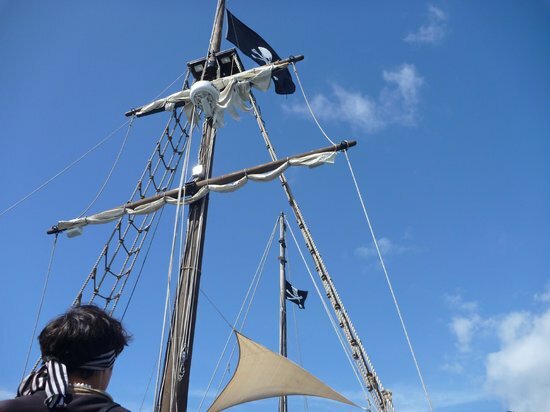 Also, the pirates exist even since the boats exist, while the privateers originate somewhere between 16-17th century. What was the goal of Privateers and how is it any different than Pirates goal? Privateers had legal goals in wealth, dominance, and control of the seas. That's all they basically wanted. Own a territory, be strong, wealthy and dominant in that area, while pirates were just a grab and run individuals/groups. The Britons also had a rule, well, not exactly Britons, but the government of the Britania. They did not negotiate with pirates. Basically, the punishment for piracy was death, except for the people who got the pardon. What is the Privateer gamemode like, then? Thrusters don't exist, you have ship cores. Ships do not break, like in Naval Play. The speed is limited and measured in knots, it depends on the structure of your ship. The maneuvering (controlling) of the ships is greatly changed. The only allowed vehicles are ships, planes/submarines can't be made, even if you tried, you wouldn't have sufficent tools to build something like that. Also, it's based on the 17th century. Ship cores are the heart of your ships. They measure the health, speed and max ammount of cannons you can have on your ship. They do such measures via the LxWxH method (Lenght * Width * Height). I also gained the impression that the mats matter, I noticed the more masts* I had, the bigger speed my ship could pull off. *The mast of a sailing ship is a tall vertical pole which supports the sails. Larger ships have several masts, with the size depending on the style of ship. A knot is a unit of speed. It is abbreviated kt or kn. A sail is a large piece of cloth on the top of some ships. The wind goes around the sail and makes the ship move through the water. 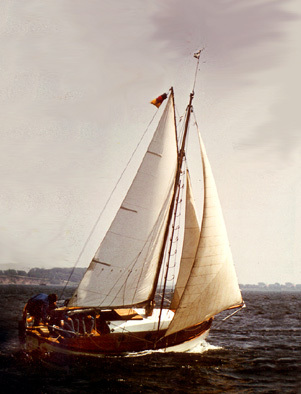 The piece that the sail is attached to is called a mast. Some ships have many sails, and some have only one. Usually, small ships have only one sail, and bigger ships have more. Ships with sails are called sailing ships. There are many different names for different kinds of sailing shipswith different kinds of sails. Before people made ships with engines that used coal or oil, sailing ships were an important way to travel across oceans. Now they are not so important for transport, but they are still used for recreation and competition. Sails on Privateer gamemode don't have any functions, except for aesthetics. We all know what cannons are. On the privateer gamemode, after you have built your ship and welded it to the propcore and welded all the props, it will calculate how many cannons your ship can carry. You can't have ships on the front/back side (aka bow/stern), only on left and right sides. If the ship core calculates e.g 8 cannons for your ship, you can have 4 on left and 4 on right side max. They ammount on both sides must be equal. The position doesn't matter. I suggest an angle of 20 degrees of the cannons, for the best aim and results. After you finished everything and welded everything (don't forget the buyoancy on the props which will be on the water, so the ship can float), place a chair on a spot which isn't covered, you got to have a view. The PvP system is based on health, not on destroying props, so the chair is safe, even if you take a hit, your health is all that matters. - How to fire the cannons? Look in the desired direction and press space, your character will yell "fire!" and the cannons on that side will fire. Then you wait for them to reload, you can see the ammount of time it takes to reload on the bottom left corner. - How to control the ship? You do that by pressing the WASD keys. W and S are used to increase/decrease the speed, but be aware that, the faster you go, the harder for your ship is to turn and the less control you have over it. A and D are used for turning and they work best at low speed, at high speed they almost don't work. This is the site of the developer of a Privateer gamemode, you can find all required info there. For the errors, just go to download and extract according to the instructions given in the same downloaded file. And remember, a smooth sea never made a skillful sailor! Altair and Locko1997 like this. Is this even a server we have?